Not long after her birthday, The Child gets sick – so sick, she has to back out of the school play, missing everything but the final performance, and then leaving before the cast party. When she recovers, we spend our evenings going over all her class assignments. Did this get turned into math? Where are you on your science project? These are the questions I ask that fill her evenings. It quickly becomes clear that she’s not just catching up on work she missed when she was sick, but perhaps a little bit from before she got sick … perhaps, quite a bit from then. I try to help her organize, and get back on track, but things keep popping up. She has to create a book cover for history class, she remembered. Oh! And also, she has to bring in food for class. In two days. She’s pleased she remembered so far ahead of time. Roman food, she says. It’s for history class. I wonder if this is my assignment or hers, but decide that her part of the assignment is probably complete now: she remembered to tell me before we got in the car to drive to school the day it was needed. I scan through my shelf and find two Italian cookbooks, my beloved Essentials of Classic Italian Cooking by Marcella Hazan, and another one, De Medici Kitchen, by Lorenza de Medici , now out of print, and which I bought for fifty cents at a thrift shop not long ago. (You can get used copies for not much on Amazon). I start by looking for a recipe that says it’s Roman, but nothing pops out – at least, nothing that is suitable for a middle school history class toga party. So I fudge it a little, and settle instead on a simple Tuscan recipe that I think the kids will like, and which doesn’t involve refrigeration, unusual ingredients, or a trip to the store. 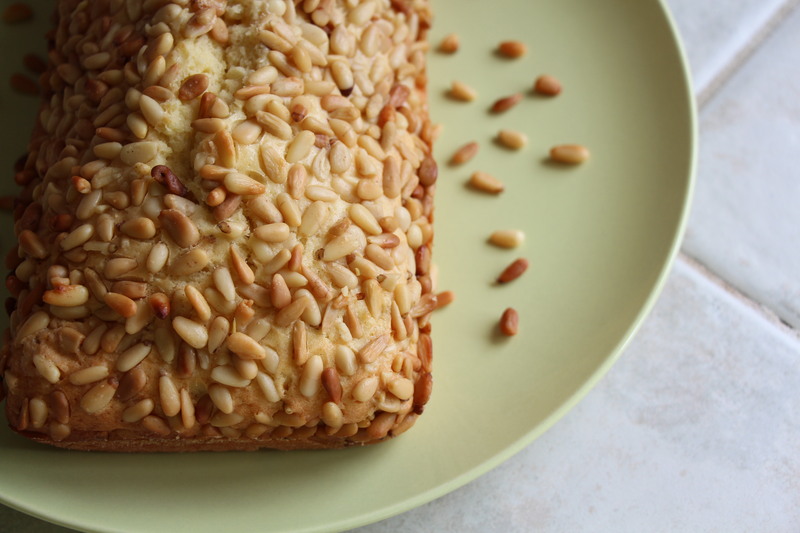 The Pinolata cake from De Medici Kitchen is incredibly simple – just a butter cake accented with pine nuts. I was surprised when I mixed all the ingredients and realized the recipe included no vanilla, cinnamon, or nutmeg. Just butter, flour, sugar – and not very much sugar at that. The resulting cake is a bit dry and very buttery tasting: The perfect thing to serve alongside a cup of coffee or tea, or to accompany fresh fruit. I liked it so much that I hated to send it off to school for the kids, but send it I did. It’s simple enough to make any time I want more. Preheat oven to 350 degrees (F). Sift together the flour, baking powder and salt in a bowl. In another bowl, mix together the butter and sugar until soft and fluffy. Add the eggs one at a time. Then add the flour mixture. The dough should be quite soft. Butter a loaf pan and dust with flour. Pour the dough into the pan and sprinkle with the pine nuts. Bake for 40 minutes or until toothpick inserted in the middle comes out dry. Remove from pan and cool completely on a rack before serving. 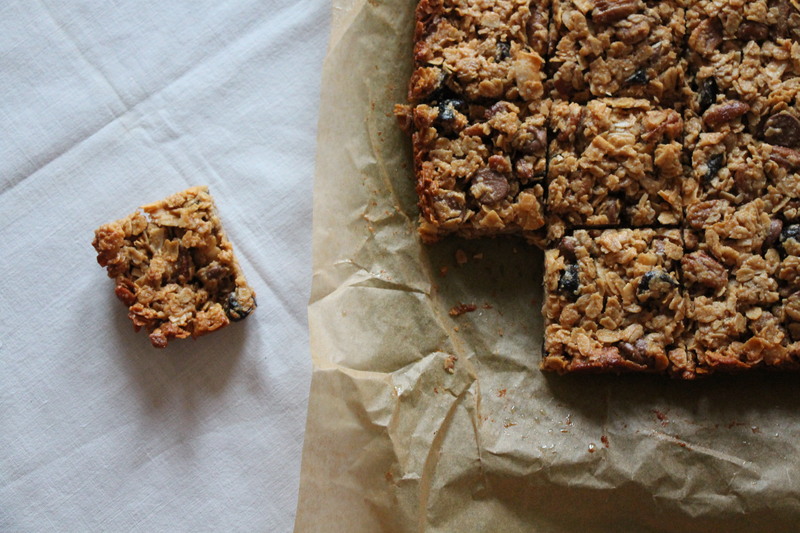 Another blogger who tried this recipe suggests mixing the pine nuts into the dough. I pressed them into the top, but found quite a few fell off and many got a rather brown, so if this is a problem, then mixing them in would be a nice solution. Growing up in Manhattan in the 1970s-80s, there were a couple of things we ate for breakfast on the weekends, neither of which my mother cooked because, well, my mother didn’t really cook much. On the weekend, she would send me out with some money and tell me to go pick something up and bring it home for breakfast. The first goal was always bagels, from the local bagel shop – hubcap sized and smeared with cream cheese and lox. But the line for the bagel place was often out the door and that was on a good day: If you got there too late, the line was out the door and halfway up the street. These days, I would get on that line and wait for one of those bagels, but back in the day I could get one any old day – I could even have one for lunch, since it was right near my school – so the line seemed hardly worth the trouble. On those days, I would take the money to the supermarket and pick up something from Entenmann’s. Now, I know what you’re thinking: Entenmann’s? The ones on the supermarket shelf next to the Hostess chocolate-covered donuts? Well, yes and no. The box was the same, sure. But the Entenmann’s that I grew up on was a family-owned company that baked their danishes and coffee cakes locally (the company was sold to General Foods in 1982). It was fresh and delicious and sometimes, just sometimes, I could get this one amazing thing: Hot Cross Buns. They came in little packs of nine square buns, with a tic-tac-toe of frosting on the top and delightful little bits of citron hiding inside. I loved how flavorful and yet not-too-sweet they were. I was always a bit sad when I went on an Entenmann’s run and couldn’t find the Hot Cross Buns, which was more often than not; but then it was a pleasant surprise when they appeared again on the shelves. Only as an adult did I discover the significance of the crosses on the buns, and realize that, yes, they were a seasonal item for Easter. It made sense when it was pointed out to me. Anyway, by the time I figured it out, Entenmann’s had changed somehow and though I couldn’t really put my finger on what was different about it, I started avoiding it. The crumb coffee cake – another favorite – lightened up and became less flavorful, less satisfying. I stopped seeing the hot cross buns at all, though possibly I just didn’t remember to look for them at the right time of year. I’m not a bread baker, so I was pleased to find a recipe for Hot Cross Muffins in my King Arthur Flour Baker’s Companion. The taste of the original without all the effort of making yeast-raised buns, said the recipe, so I tried it. I wanted them to be the best effort possible, to resemble my childhood treat, so I made some Candied Orange Peel a few days ahead, to use in lieu of the citron. I used very cheap oranges from Target’s produce department (perhaps not the finest produce department I’ve ever seen), and though they came out a bit small and sad-looking, they were quite flavorful. The muffins were very close to the hot cross buns I remember from my childhood – perhaps not quite as light a texture as the original, but I think a bit of flour-sifting might resolve that issue. I loved all the plump raisins and sweet, chewy bits of peel. The frosting is dense and adds just the right touch of buttery sweetness to the muffins, which are not actually terribly sweet – meaning they were just right. Batter: Mix together the raisins and water in a bowl, and set aside. In a large bowl, whisk together all of the dry ingredients. Make a well in the center and add the raisins and citrus peel. Beat together the eggs, milk, and melted butter, then add to the dry ingredients all at once. Stir until everything is evenly combined. Scoop into 12 greased muffin pans (or use paper liners). Bake for 20-25 minutes until nicely browned and a cake tester comes out clean. Remove them from the pans and allow them to cool for 5 to 10 minutes before icing. Icing: Combine all the icing ingredients in a small bowl and beat till thick. Use a pastry bag and tip to pipe thick crosses onto the muffins. (If you don't have a pastry bag, fill a sturdy plastic bag with the frosting, squeezing it down into one corner. Snip the tip of the bag off, and squeeze the frosting onto the muffins.) I used a ziploc bag ... it works fine. Not elegant, but still plenty tasty.